Washing machines aren’t particularly exciting, but that doesn't mean you should impulse buy as soon as your existing machine packs in. Especially when there’s some really great washing machine deals floating around. Top retailers are offering some hefty savings on some of the very best machines. But if you see something you like, grab it while you can - some of the washing machine deals we saw over Black Friday sold out pretty quickly. And with some deals lasting just days, you’re better off snapping up the discount as soon as you see it. On this page, we’ve put together our list of the best washing machine deals we can find. So instead of spending hours searching through Currys, Amazon and John Lewis, just take a look at our favourite washing machine bargains right here. We'll regularly update this page, too, so pop back in if nothing takes your fancy now. 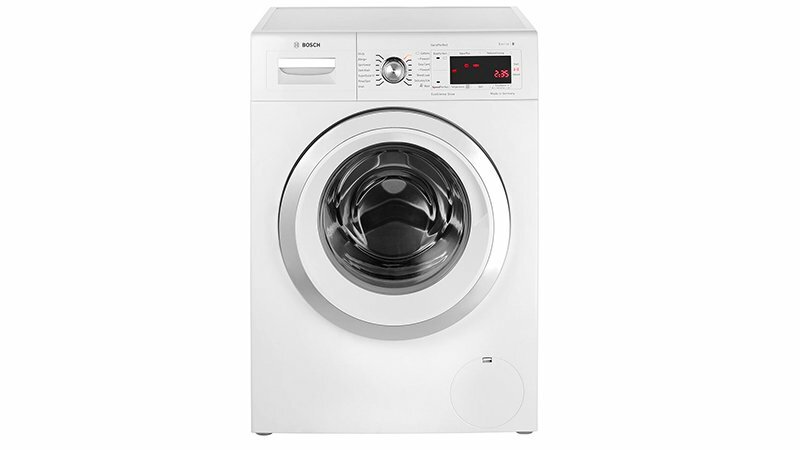 You can currently save £80 on the Bosch Serie 8 WAW32450GB washing machine over at AO. This nifty model is fitted with an ecoSilence drive which has fewer moving parts to keep things quiet, so it's a great buy if you're in an open-plan space. There's a 15-minute quick wash for speedy cleaning and the 9kg drum is ideal for medium-sized households. With two quick wash programs (Rapid 15 and 60) and a nifty Speed Eco feature that can reduce wash programs by 65%, the Siemans iQ300 WM14N200GB is ideal if you're looking for an appliance that'll give you super-speedy cycles. The brushless iQdrive motor runs quietly while conserving energy and the Smart Washing 3-D sensor ensures optimum water levels, depending on the load's size and fabric. Featuring in our roundup of the best washing machines, the Siemans iQ300 is now available at a really great price. At £449, you'll save £130 on its original RRP of £579. And for added peace of mind, Siemans are extending the washing machine's guarantee from 2 to 3 years at no extra cost. Monitor and control this Hoover washing machine with your smartphone thanks to its nifty NFC feature that connects to the Hoover Wizard Android app. Simply tap your device on the washing machine to efficiently set washes, choose your cycle and troubleshoot any problems. Designed with you in mind, the washing machine comes fitted with a large porthole for easy loading, a decent 8kg capacity, a speedy 15 minute quick wash cycle and an A+++ energy rating. And all that comes at the bargain price of £259, since Currys applied a £71 discount to the appliance. This Hotpoint Smart washing machine cuts down on water and energy usage to save on household bills. Using Auto+, the washing machine will measure the load size to deliver optimum drum action and water levels. To get the most out of your detergent, Speed+ raises the water temperature and increases the spin cycle while Performance+ optimises the wash to target tough stains. The WMFUG742P comes with plenty of programs, including Anti Allergy, Eco Cycle and 30 minute Fast Wash, a decent 7kg capacity and a Timer Delay function. And the best part? Currys has knocked £81 off its RRP of £330, bringing the price down to £249. This discount is available on the white and graphite models. Busy household with masses of washing? Thanks to its supersize 10kg load capacity, quick spin speed of 1400rprm and 15 programs to choose from, including easy iron and extra rinse, the Hoover DWFT41AH8B is the washing machine you've been looking for. It's also got Wi-Fi connectivity and One Touch technology, which means you can control the appliance from your smartphone using the Hoover Wizard app. John Lewis has knocked the Hoover DWFT41AH8B down to £634 with a lovely £90 saving. There's no telling how long this deal will last but we'd invest now if you like what you see. In the Argos sale, the Hoover Dynamic Next DXOA410C3B washing machine has dropped to £299 with a £100 discount. It has an extra large 10kg load capacity fit for large families, three quick wash settings (running for 14, 30 and 44 minutes) and NFC connectivity which allows control of the appliance through an Android app. Ideal for busy households, the Samsung WW90M645OPM has a nifty Addwash feature that’ll let you add stray socks, your favourite top or even extra detergent mid-cycle. The QuickDrive technology will also improve the cycle’s speed and efficiency by up to 50%. The backplate and drum spin in opposite directions to give a deep and thorough clean. It’s got Smart controls, too, so you can check on your load with your smartphone. At AO.com the Samsung QuickDrive has been reduced to £734, which means you'll save a cool £165. And until 31 August you claim a £100 Virgin Experience voucher with this appliance. Just register your appliance between the 21 and 60 days from purchase on the Samsung website. Apple EarPods review: They’re free with all iPhones but are they any good?